In the last four years, RUFORUM has engaged in using social media as one of the tools for advocating for increased dialogue and investment in the Higher Agricultural Education sector. This has resulted into increased online engagement of both youth and academicians in deliberating on key development issues across Africa. With support from the RUFORUM Network, we have trained of over 250 African graduates. The importance of social media for universities cannot be underrated when it comes to brand identity, recruitment, and funding. Social Media provides opportunities for universities to solidify their brand, attract potential students and connect with alumni who are potentially useful in funding universities through giving back both financially and in-kind. The training provided me with a hands-on experience of the various social media platforms. I realized how versatile social media is, as mode of communication, information sharing and networking with other professionals, staff and students. I particularly appreciated linked-in, because I believe the platform will give me an opportunity to acquire and share professional information with like-minded people. As a quality assurance officer, I hope to use the various platforms to conduct surveys and seek opinions from students and staff about any quality assurance matters in the University. Given the scope and speed, I expect to reach majority of the stakeholders and of course give an instant feedback about any interventions in place. It will also be easier to reach University alumni when conducting graduate tracer surveys especially through their whatsApp and Facebook accounts. Since internationalization is one of the core values of Busitema University, Social Media is an instrument that can enhance branding and increase visibility of the University to potential international students and partners. Recent trends indicate that universities need to embrace Social Media as a tool for improving the quality of services and marketing the institution both locally and globally. You can reach Elizabeth @jokukiriza on twitter. The training has provided a well-grounded insight into social media. I am so amazed on how the session was conducted. My perception of social media has greatly changed (updated). I have come to appreciate the power of social media. The ability to freely create content, share, and get feedback is amazing. The training has been an eye opener, it is clear that social media is a strategic tool towards harnessing more opportunities. It cuts across many grappling issues, explores many perceptions and allows one to tap into greater minds. It is so clear that as a university, we have the capacity to overcome challenges much more when we fully harness the power of social media. Going forward, I can contemplate the path to making my lectures more interesting for the students. I feel empowered to provide an engaging environment for students that is more interactive, dynamic and cost effective to the university. I believe with the element of social media, sharing of content we as African academics can greatly make strides towards the development of Higher Education institutes. You can reach Ronald at @Ongironald1 on twitter. The training on social media was very useful and handy. I understood that social media can be used for much more useful engagement besides socializing which most of us have known it for. I learnt that it is a very strong tool for sharing important information and connecting with a multitude of people globally. Research and communication can be made much simpler with the proper use of social media tools. Another important concept I learnt is on Ethics and Integrity when using Social Media and how crucial it is when engaging online and creating one’s brand. Knowing your audience is also key. The simplicity of communicating using relevant pictures and social media platforms was one of the many highlights of the training. As an E-learning focal person in the Faculty of Engineering, this is a very important tool and key to the policy implementation, content development and learner support. With the skills attained in this training, I hope that Busitema University will adopt to the culture of social media and use it to publicize increase its visibility globally. Keeping in mind that this can only be possible with such training’s and becoming trainer of trainers. I pledge to be part of this change to drive the University towards this amazing and interesting direction of social media branding. Areas of teaching: Statistics: Biostatistics, Data modeling, Quantitative methods, and Mathematical economics. The training on social media has been comprehensive and very educative. I have indeed appreciated the role of social media platforms (twitter, Facebook, blogging) in knowledge dissemination and networking. After this training I intend to do the following; Share the knowledge acquired with my fellow staff and students at the Faculty, practice more in the use of social media platforms in attaining our core values as a university namely; teaching, learning, and outreach, encouraging colleagues to always share knowledge and new experiences on social media because it is the only way to widen our visibility individually and as a university at large and use social media to further pursue my dream of becoming a consultant in applied statistics. Lastly, I sincerely thank RUFORUM for the wonderful work done in the field of knowledge generation, and dissemination. With this spirit, society transformation is a MUST. You can reach James at @SsuunaJames1 on twitter. The social media training was so interesting, engaging, it aroused my intelligence and the material was up to date with skilled, friendly and patient facilitators who were ready to offer support at all times. I was able to share and learn new ideas on social media and how it is a marketing tool for institutions of higher learning like Busitema University. The training has enhanced my knowledge on social media, the development of the internet ecosystem using the educational framework, to strengthen teenagers’ knowledge in ICT, build capacity for every one through outreach for socio-economic transformation and sustainable development which also is the mission for Busitema University. I will be able to share skills on social media with friends and encourage them to use social media because it is the cheapest marketing tool yet targeting a wider audience. You can reach Grace at @graceadong21 on twitter. During the training, key issues pertaining to marketing of the university activities was emphasized. This training helped members to clearly understand how information sharing is important to the success of the university in the areas of teaching and learning. I learnt that one can use the social media to generate ideas on topics of importance to achieve organizational goals. This will help disseminate information to intended audience much faster. Most important, was the participatory approach of the training that enabled participants to understand and appreciate the importance of social media in the daily life scenarios. After the training, I will put into practice the knowledge learnt to effectively communicate to my audience and ensure that the students under my guidance gain experience and knowledge as a result of use of social media. I also dream to have full knowledge on social media management in order to provide guidance to other members of the community on the usage of social media. I intend to spearhead the use of social media to enable the learning and teaching environment to be so interactive and involving thus achieving pursuance of excellence. I would wish that RUFORUM would extend such trainings to our faculties for the benefit of our clients. You can reach Joseph at @esuku01 on twitter. The social media training is a nice one; it brings out the true information on communication. I have also learnt that there is a lot to do on twitter and it is one of the best ways of communicating and learning of the activities that take place online. After this training, I will use the knowledge that I have acquired to improve on the image of the Busitema University through creating an online account for the University and advise management on the importance of using twitter and how to advertise the University using social media. Permitting to the changing technology social media is the way to go. It will help in awareness of the institution online and some activities that take place and also a source of Mobilization to an institution. I thank the vice Chancellor of Busitema University for involving ICT team and the RUFORUM staff in the training as it will help the University and staff to pursue excellence for God and my country. I have learnt that twitter, Facebook, and blogging are not just platforms through which imprudent exchanges, rumors, and fan about individuals prevail. It is an avenue through which Busitema University will attract and build a more relevant audience to its mission and vision, continue to engage and retain them as customers of its diverse outputs in research and innovations, and outreach projects. The novel outputs of ongoing research and outreach at Busitema University shall be publicized to those communities who cannot find abstract content in published papers and journals in more simplified “language” for easy adoption. 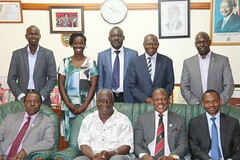 A wider research collaboration shall be fostered aimed to build international research teams with academic staff self-identified through these platforms, more students across national boundaries shall be attracted to the Natural Resource Economics and Environmental Sciences, and will attract more partners to sponsor research based on the identified potential posted through the three platforms. You can reach David at @KNsajju on twitter. The training on use of social media impacted me at two levels: At the individual level, the training not only re-kindled my interest in the use of Facebook and Twitter but also the resolve to stay active on these platforms – My Facebook and Twitter accounts have been redundant for years now. I also picked interest in blogging and resolved to post a blog every month. At an institutional level, the training opened my eyes to the apparent invisibility of Busitema University (BU) and the need for a communication strategy to address this challenge. I was elected to be part of the team that will revise BU’s draft communication strategy – and I look forward to participate fully. After the training, I now appreciate the role of social media. After the training, I will write a report to recap on key points of theory and individual action points. By this stage without exception, I have seen a measurable improvement. Am feeling inspired and ready to share with my friends and the campus. I thank RUFORUM and Busitema University for having given me such a great opportunity to be one of the participants. You can reach Sylvia at @KyomugishaSylv2 on twitter. ← Political Will, The missing domino?